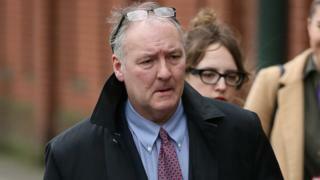 Patients of a disgraced breast surgeon say they feel "airbrushed" and are demanding their surgery be reviewed after he was found guilty of wounding. Ian Paterson's NHS mastectomy patients were recalled but those who had lumps removed were not. The Heart of England NHS Trust said patients would not be recalled "unless there was a need". Victims said the 59-year-old, who was found guilty of 17 counts of wounding with intent, had a "God complex". His convictions relate to nine women and one man in private hospitals in the West Midlands. Last January, a report recommended that the surgery of up to 20% of Paterson's wide local excision patients be investigated. The procedure involves removing the cancer and some normal looking tissue around it. Paterson's trial heard he exaggerated cancer symptoms in his patients, performed unnecessary operations and also pioneered unregulated "cleavage-sparing" surgery. The jury was not told he had been suspended from Solihull Hospital in 2011 for performing hundreds of botched and dangerous operations, for which the trust has paid out almost £10m in compensation. Dr Richard Brown, who carried out a review into Paterson's work, found 238 of 935 patients who had a wide local excision had died. He called for people's surgery to be investigated, but over a year on the trust says it has only looked at 10% of patients' notes. The Dr Brown review looked at how many of Paterson's patients had died, and how many people had seen a recurrence in their cancer. It identified 675 of his 1,207 NHS mastectomy patients have died, while the trust said 68 of his surviving patients have seen their cancer return. He treated many more at private clinics owned by Spire Healthcare. But Heart of England NHS Trust has never looked into what his patients died from, nor has it done any work to establish how many of them also had a cancer recurrence. The trust says it is putting Paterson's surviving patients first. It said: "The focus has been to ensure that Ian Paterson's 500-plus living mastectomy patients are safe, reviewed appropriately, have a personal care plan and are supported as best they can be in extremely distressing circumstances." Ann Butler, chair of the Breast Cancer Support Group, is one of 68 patients living after breast cancer returned. She said: "It is just as if they want to airbrush us out of the situation and there are still thousands of us left. "Not just cleavage-sparing mastectomy patients but women who have had wide local excisions and lumpectomies. "Nothing has been done about those." The trust said: "We have looked at 10% of the patient clinical notes to assess their initial treatment and also whether they had radiotherapy or chemotherapy. "We would not recall wide local excision patients unless there was a need because of the distress and inconvenience caused to the patients." Paula Gelsthorpe is among those calling for a public inquiry. She had two lumps needlessly removed in 2002 and 2009. "I don't think he's the only one. I think that there were people that knew about this, about what he was doing and they are hiding behind him now," she said. "There should be a public inquiry. Somebody must have known what he was doing." Paterson is due to be sentenced this month. Video What is cleavage-sparing surgery?